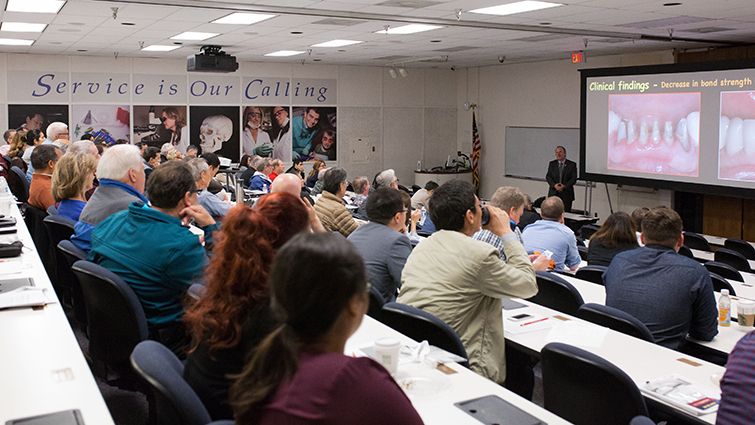 Our mission in Continuing Dental Education is to enhance the dentist's ability to care for patients. It is our responsibility as the accredited sponsor of continuing dental education activities to assure that the activity is designed for this purpose. Unless otherwise noted, all courses are held at Loma Linda University School of Dentistry, 11092 Anderson St., Loma Linda, CA 92350. Room number will be indicated at the time of registration. All applications are processed in the order they are received. No reservations can be made without tuition payment. At-the-door registration is not advisable, but is permissible when space is available. Courses are canceled or confirmed two weeks prior to course date. Please register early to avoid course cancellations. All dental courses are approved for continuing education credit on an hour-for-hour basis by the California State Board of Dental Examiners and the Academy of General Dentistry, up to a maximum of 8 educational units per day. Please refer to the course outline for the number of units. Continuing education programs offered by Loma Linda University School of Dentistry are intended to be for review purposes only. Additional training may be necessary to become fully proficient in any area or technique whthin dentistry. All checks should be made payable to Loma Linda University and mailed with the application to Continuing Education Department, School of Dentistry, Loma Linda University, Loma Linda, CA 92350. Please make note to allow sufficient time for your check to reach us in time for registration prior to the course. It can take up to three extra days due to the fact that all mail must go through the University mail system as well as the US Postal Service system prior to reaching us. MasterCard, Visa, and Discover cards are accepted. NOW AVAILABLE: Funding available to qualified individuals through the Sallie Mae Smart Option Student Loan® program. Please visit the Sallie Mae website for more information. Loma Linda University Continuing Dental Education is CERP, AGD, and ACDE approved.